Summer is the time for garden parties. During the mid to late summer months, gardens are lush with foliage, fragrant flowers and backyards certainly look their best. No need to spend a fortune reserving restaurants, clubs or posh destinations for your upcoming birthday party, bridal shower, or neighborhood dinner. Instead, transform your own back yard, garden or patio area into an idyllic summertime retreat. With just a bit of planning, menu preparation, eclectic table settings and summer-themed decor, you can dress up a backyard picnic table and create a lavish tablescape fit for a magical mid-summer nights dream of a garden party. Consider creating your tablescape with floral china, a summery drink dispenser and other special tableware. Here are some simple tips, creative and inspirational designs, eclectic table settings for creative tablescapes, and perfect summer time menu items to include when planning a garden party. Start by selecting an area of your garden or backyard to transform. Prepare the garden area with weeding, edging, mulching, pruning, planting, fertilizing, etc. Mow the yard, arrange colorful planters around the garden area for an added splash of color. If you are planning for an evening event, add tiki torches, string up some delicate paper lanterns and perhaps some table top citronella candles to help ward off the mosquitoes. Vintage lace table clothes, cloth napkins, and elegant table top runners are simple touches that can truly transform an old picnic table, card table, or patio table. Disguise old chairs by pinning or stitching together lightweight fabrics to serve as seat covers or full slip covers. For a more formal look, arrange the seating with place card holders. Write the names of guests with script or calligraphy on themed place cards. Plan a menu that highlights the fresh flavors of summertime garden bounty. Serve fresh veggie slices with hummus or dip as an appetizer. Prepare a tropical salad as a first course (butter lettuce, rainbow chard, red pepper, mango, papaya and toasted macadamia nuts) add mint vinaigrette or other homemade herb dressings. Cold soups such as cucumber dill soup, cold carrot soup or even borsch are other light and flavorful summertime classics. For the main course, try grilled shish kabobs, pineapple grilled chicken, or even fresh seafood items such as tuna and wasabi or oysters with white wine sauce, etc. Pasta salads, potato salads, quinoa with spices, or brown rice are ideal side dishes. For dessert, you can't go wrong with fruit salads, rhubarb or blueberry pies, or peach cobblers served with fresh cream, ice cream or sorbets. Summertime garden parties are the perfect opportunity to employ your crystal water pitchers, antique lemonade jugs or retro lemonade dispensers, vintage iced tea glasses, silver ice buckets and water goblets. Add a sprig of mint, some slices of lemon or lime or even a sprig of lemon verbena to the ice water or iced tea. Wine spritzers (two parts white wine and one part club soda) are refreshing summertime drinks. Or, opt for Prosseco, a delicious, Italian sparkling wine, typically cheaper than champagne, which can be mixed with fruit nectars such as guava or melon for a luxurious summer flavor. 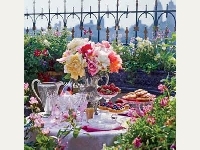 Garden parties are the ideal opportunity to display your more eclectic table settings. It's okay to get creative in the garden! Mix and match antique floral dishes, tea cup and saucers. Wine glasses and water goblets needn't be matching sets. Utilize serving platters, fruit bowls, cheeseboards, even ornate candle sticks and vases. Use vases of flower bouquets, tabletop potted plants, or dramatic floating displays of flower petals and tea lights as table top centerpieces for your garden party.